David Griffin breaks down Al Horford's triple-double. Started all 74 games he played in, averaging a career-high 17.4 points, career-best 10.2 rebounds, 3.2 assists, 1.1 blocks and 1.1 steals in 37.2 minutes (.543 FG%, .500 3FG%, .644 FT%) • Finished sixth in the NBA in double-doubles, eighth in rpg, 10th in FG%, t25th in ppg and 30th in bpg • Recorded 43 double-doubles (20 20-point/10-rebound games), including one point/assist • Scored 20-plus points in nine consecutive games (2/11-3/3) for the first time in his career • Scored in double-figures 68 times, including 27 20-point efforts (one 30-point game), and the Hawks were 22-5 in those contests • The NBA's Eastern Conference Player of the Week for games played 11/19-11/25 • Hit a career-best two 3FGs (2-2) while scoring 20 points @PHO (3/1) • Set new career-highs with 34 points and 14 FGM (14-22), also grabbing 15 rebounds and blocking five shots in 43 minutes @UTA (2/27) • Recorded his third career 20/20 game with 23 points and a career-high tying 22 rebounds in 40 minutes @DET (2/25) • Tied career-high in FTM (10-11), scoring 24 points (also 13 boards) in 51 minutes v/BOS (1/25) • Missed four games due to injury (illness; 11/14, 3/29-3/30; sore left calf; 1/23), and recorded four DNP-Coach’s Decisions • SEASON HIGHS: 34 pts @UTA (2/27), 22 rebs @DET (2/25), 10 assts v/WAS (11/21), 4 stls (2x), 5 blks @UTA (2/27), 14 FGM @UTA (2/27), 2 3FGM @PHO (3/1), 10 FTM v/BOS (1/25), 51 mins v/BOS (1/25). Through his first six years in the league, has played in 391 games (387 starts), averaging 13.7 points, 9.6 rebounds, 2.6 assists, 1.1 blocks and 0.8 steals in 34.4 minutes (.539 FG%, .333 3FG%, .739 FT%) • In addition to Horford, those career averages have only been reached by Kareem Abdul-Jabbar, Shaquille O’Neal, Dwight Howard and Artis Gilmore, according to Elias Sports Bureau • Ranks seventh in franchise history in defensive rebounds (2,728) and eighth in blocks (434) • Has recorded 289 double-figure scoring games, and has grabbed 10-or-more rebounds 199 times • A two-time All-Star (2010, 2011) • Has totalled 165 double-doubles • Has missed 78 games due to injury • Appeared in 11 contests (all starts) in 2011-12, averaging 12.4 points, 7.0 rebounds, 2.2 assists, 1.3 blocks and 0.9 steals in 31.6 minutes (.553 FG%, .733 FT%) • Missed 55 games due to a torn left pectoral muscle (suffered 1/11 @Ind) and subsequent surgery • In 77 games in 2010-11, posted averages of 15.3 points, 9.3 rebounds, 3.5 assists, 1.0 blocks and 0.8 steals (.557 FG%, .500 3FG%, .798 FT%) • Ranked 5th in the NBA in FG%, 28th in blocks and 16th in efficiency (22.5) • One of the top allaround rebounders in the league, finishing 11th in rebounds, seventh in def. rebounds (7.0) and t24th in off. rebounds (2.4) • Had 36 double-doubles (tied for ninth in NBA), including 1 20/20 game • Named Third-Team All-NBA, and earned his second straight All-Star appearance • 2009-10: Had an outstanding season, becoming the first Hawks draft pick to earn an All-Star berth since Kevin Willis • Contributed 14.2 points, 9.9 rebounds, 2.3 assists, 1.1 blocks and 0.7 steals in 35.1 minutes (.551 FG%, .789 FT%), appearing in 81 games • Ranked eighth in the NBA in FG%, 10th in rebounds, t-ninth in off. rebounds (2.9) and 26th in blocks • Had a team-leading 39 double-doubles (t11th in the NBA) • Started all 67 games he played in 2008-09, averaging 11.5 points, 9.3 rebounds, 2.4 assists, 1.4 blocks and 0.8 steals in 33.5 minutes (.525 FG% - 15th in the NBA, .727 FT%) • The only player unanimously selected to the NBA All-Rookie First Team (and runner-up for Rookie of the Year honors) in 2007-08 • Became the first Atlanta draftee to earn first team honors since Stacey Augmon in 1991-92 • Averaged 10.1 points, 9.7 rebounds, 1.5 assists, 0.9 blocks, 0.7 steals and 31.4 minutes in 81 games (77 starts). Horford has appeared in 48 playoff games for Atlanta (47 starts), totaling 12.4 ppg, 8.7 rpg, 2.7 apg and 1.1 bpg (.478 FG%, .745 FT%) • Played and started in all six games of the Hawks’ 2013 first-round postseason loss to Indiana, averaging 16.7 points, 8.8 rebounds, 3.0 assists and 1.0 steals in 36.3 minutes (.494 FG%, .667 FT%) • Played in three games of the 2012 first-round loss to Boston (missed the initial three contests due to continued rehab for a torn left pectoral), and averaged 15.3 points, 8.3 rebounds, 2.7 assists, 1.3 steals and 1.3 blocks in 36.0 minutes (.588 FG%, .750 FT%) • In Game Five at Philips Arena, in his first start since January 11, put in 19 points, 11 rebounds, three assists, three steals and three blocks (8-15 FGs, 3-4 FTs), helping lead the Hawks to an 87-86 win • In starting all 12 postseason contests in 2011 against Orlando and Chicago, compiled 11.3 points, 9.6 rebounds, 3.5 assists and 1.0 blocks in 39.0 minutes (.423 FG%, .769 FT%) • Started all 11 contests in the 2010 postseason vs. Milwaukee and Orlando, and averaged 14.6 points, 9.0 rebounds, 1.8 assists and 1.7 blocks in 35.3 minutes (.523 FG%, .839 FT%) • Played and started in nine contests in the 2009 Playoffs against Miami and Cleveland, and averaged 6.9 points, 5.8 rebounds and 2.0 assists in 28.0 minutes (.424 FG%, .667 FT%) • Had an outstanding postseason series vs. Boston (2008 Playoffs), averaging 12.6 points, 10.4 rebounds, 3.6 assists and 1.0 blocks (.472 FG%, .741 FT%) • Became the 24th rookie in NBA history (first Hawk) to put up at least 20 points and 10 rebounds in his playoff debut • PLAYOFF CAREER HIGHS: 26 pts v/IND (4/27/13), 16 rebs v/IND (4/27/13), 6 assts (4x), 3 stls (2x), 5 blks v/ MIL (4/17/10), 46 mins @BOS (5/10/12), 12 FGM v/IND (4/27/13), 1 3FGM v/MIL (4/28/10), 6 FTM (4x). Horford capped off an outstanding collegiate career by helping the Florida Gators to their second straight national championship in 2007, as the Gators became the first school to win back-to-back titles in 15 years • Finished career as the school's 35th all-time leading scorer with 1,123 points (career averages in 109 games (103 starts) - 10.3 points, 7.9 rebounds, 1.7 blocks, .586 FG%, .624 FT%) • Horford, Joakim Noah (Chicago) and Corey Brewer (Minnesota) were taken in the first nine picks of the 2007 Draft, which marked the first time three college teammates were selected that high • In his junior campaign (2006-07), in the title game, his 18 points and 12 rebounds led the Gators to an 84-75 victory over Ohio State (at the Georgia Dome) • Had career-bests of 13.2 points and 9.5 rebounds (team-high, second in the SEC), in addition to blocking 1.8 shots (.608 FG%, .644 FT%) in 38 games • As a sophomore (2005-06), tallied 11.3 points, a team-high 7.7 rebounds (sixth in the SEC) and 1.7 blocks (also sixth in the conference) • Led the Gators to their first-ever NCAA basketball championship, cruising to a 73-57 win over UCLA • Exceeded expectations as a freshman (2004-05), averaging 5.6 points, 6.6 rebounds and 1.6 blocks (.480 FG%, .582 FT%) in 32 games. 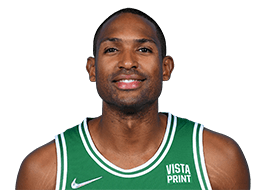 Born in Puerto Plata, Dominican Republic • Married 2003 Miss Universe Amelia Vega in Santo Domingo (DR) on December 24, 2011 • His parents are Alfredo "Tito" Horford and Arelis Reynoso • Tito played three years in the NBA with Milwaukee (1988-90) and Washington (1993-94) • Has three brothers and two sisters • Brother Jon is in his junior season at Michigan • A telecommunications major at Florida, would work in TV or real estate if he wasn't playing pro ball • Has continued work towards his degree since leaving Gainesville • Has hosted basketball camps in Atlanta, Michigan and the Dominican Republic • The first player in the league to co-direct a night of programming at Atlanta’s NBA TV studios • A two-time winner of the NBA’s Community Assist Award (February ’08 and March ‘11) • In 2011, donated $23,000 to Direct Relief International to help the people of Japan recover from the tsunami and earthquake • Has hosted holiday parties for underprivileged kids • Supports Atlanta-area Hispanic youth groups, including the STAR House and La Amistad, where he has conducted Reading Timeouts and donated tickets to Hawks games • Earned the Jason Collier Memorial Trophy at the end of the ’09 season, presented annually to the individual who best exemplifies the characteristics Collier displayed off the court as a community ambassador • Loves all types of music and is a very good ping-pong player • Considers his mom the person he admires the most • He's visited the White House on two occasions following the NCAA championship and says if he could be anyone for a day it would be the President • Enjoys eating white rice and black beans, beef and chicken dishes and sweet plantains • Horford's favorite actor and actress - Denzel Washington and Jessica Alba • His favorite movie is “Dark Knight Rises” and top TV show is “American Dad” • Wears size 17 basketball shoes • Is on twitter @Al_Horford.